Don’t take this CD too seriously 😉 Occasionally one of these tunes comes out and one shouldn’t suppress it! The melodies & bassline in Electric Cosak are played on the Juno-60 and Pulse synths, the shouting ‘hey’ sample is from Boney M’s Rasputin tune, drums from Alesis HR-16 and other stuff. 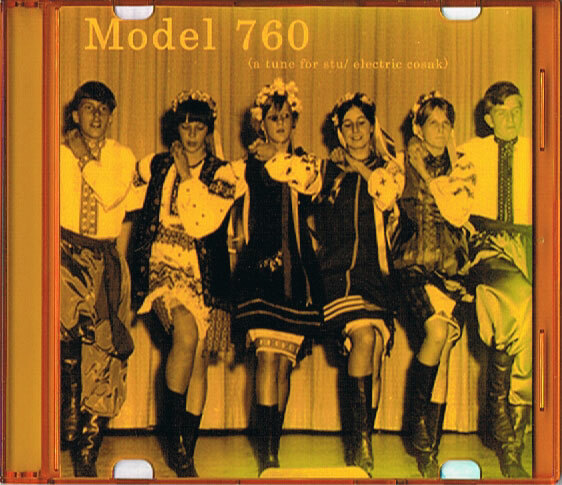 Somehow I ended up sampling some random Radio Moscow and using a pic of Russian dancers for the cover! It’s bouncy cheesy feel meant I had to dedicate it to my friend and fellow cheese maker Stu who totally deserved it 😉 Motion Freq is a more sane b-side based on a preset from the Rhodes Model 760 keyboard I had at the time, a funky dancy tune programed with a good swing to it.